The introduction of warm tones from reclaimed Maine timber creates a comfortable setting for staff and patients. Existing tall windows with views toward Back Cove combine with earthy and watery colors in the waiting area. With quiet colors, interesting textures, and a splash of color, the kitchen/break/meeting room is a great place to decompress. Patients can’t miss the nurses’ station, with its layered colors and textures cued to the overhead lights. Warm finishes for the check in desk for Lasik and exam patients include reclaimed Maine timber on walls and ceilings and a quartzite visual tile. The exam rooms are purposely devoid of color in order to minimize afterimage adjustments that can slow the efficiency of the exam. Maine Eye Center’s Retina and Surgery Center developed from master planning efforts to address growth within the practice. Maine Eye had outgrown their existing facilities and were operating with significant surgery scheduling constraints. The practice explored numerous options, including renovations and additions, new buildings, and leased space in existing medical buildings. Ultimately, they decided to relocate into a 25,000-sf leased office space. The space had previously served as a class B office space and required a full gut renovation including significant infrastructure upgrades. The design locates the surgery center and Lasik clinic on the first floor and the retina clinic on the second. Each floor operates independently, with its own check in, waiting, and check out. The surgical center includes 4 operating rooms, pre-op and post-op, and instrument processing. The retinal floor includes exam rooms, offices, testing rooms, staff areas, and support spaces. 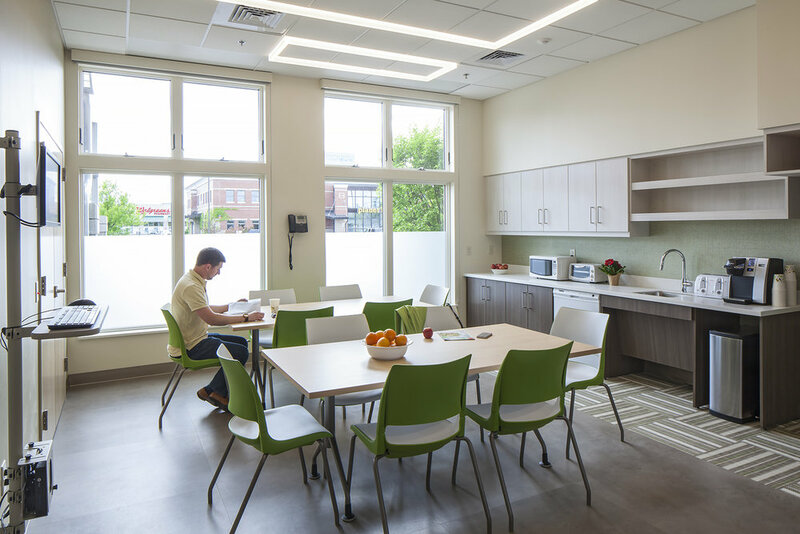 Maine Eye Center’s design process paralleled a gastroenterology practice fit-up also designed by PDT Architects on the building’s remaining two floors. Making the most of the opportunity, the design incorporates common infrastructure such as generator, medical vacuum, and receiving facilities. For Maine Eye Center’s website, click here.